A composite image shows an outdoor ad on the Municipal Services Building at 15th Street and John F. Kennedy Boulevard. 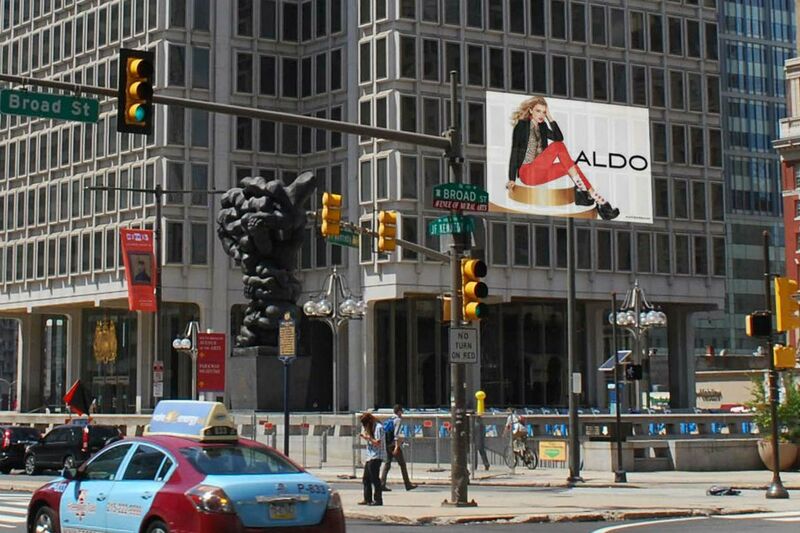 The Philadelphia Art Commission gave an initial thumbs-down to a plan for big advertising signs on two government-owned buildings at the base of the city's Champs Elysees-inspired cultural corridor, but invited the plan's proponents to come back with new approaches. The panel voted Wednesday against the plan for billboards on the Municipal Services Building at 1401 John F. Kennedy Blvd. and on the One Parkway Building at 1515 Arch St. Some of the ads would have overlooked the southeastern end of Benjamin Franklin Parkway, the lush fountain- and statue-studded thoroughfare that links core Center City with the cultural district surrounding the Philadelphia Museum of Art. "When you start slamming signs up on government buildings, it's going to look awful," said commission member Robert Roesch, a sculptor. Others said the proposal by Cherry Hill-based Interstate Outdoor Advertising LP and engineering and architecture firm Tantala Associates LLC of Philadelphia would degrade views in the area and set a dangerous precedent for more such advertisements. The commission's move defers a decision on the first known attempt to place billboards on municipal buildings since the May 2013 passage of a bill sponsored by City Council President Darrell L. Clarke to allow ads on city-owned property. During the hearing, commission chair Alan Greenberg read a letter from Clarke expressing support for the proposal, which the council president characterized as an "an alternative to raising taxes." Another letter read, from First Deputy Managing Director Brian Abernathy, expressed support from Mayor Kenney and estimated that the advertisements on the two buildings would generate $500,000 in revenue for the city. Interstate Outdoor Advertising's president for development, Jeffrey Gerber, did not return a call after the hearing asking about plans for following the commission's decision, which allows the company to return with alternative proposals for ads at the two properties. Gerber said during the session that his company was selected at the conclusion of a request-for-proposal process that began in 2014. A copy of the original RFP shared with the Inquirer identifies the Municipal Services and One Parkway Buildings, along with more than 100 libraries, recreational facilities and auto garages, as candidates for advertising. Hundreds of city vehicles also are designated as available for ads. City spokeswoman Ajeenah Amir said this week that those two buildings were the only properties to attract any interest from developers. The contract to post ads on the buildings would run for a one-year term, with three potential one-year renewals, she said. Gerber said the proposal presented Wednesday had been "informally approved" by the Pennsylvania Department of Transportation, which would have been tasked with reviewing the plan after it achieved its city permits. PennDot has jurisdiction over signs on Arch Street and JFK Boulevard buildings under the Highway Beautification Act because the two streets are designated state routes. Signs on non-limited-access routes such as Arch and JFK must be spaced at least 100 feet apart, among other regulations, according to PennDot spokesman Eugene J. Blaum. Blaum said the agency was not aware of having granted Interstate Outdoor any unofficial approvals for the ads. "This situation is still to be determined when applications are submitted to the department," he said.